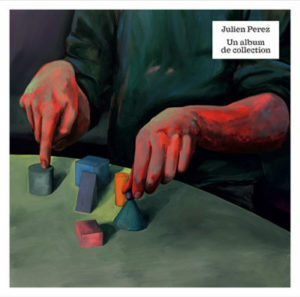 Since 2015, the musician Julien Perez, aka PEREZ, has initiated a project to produce a pop album involving 11 works chosen from the frac île-de-france collection. The obviously impossible task of translating a work of art into a song unequivocally leads to the implementation of strategies aiming to find connections and to fabricate equivalences. To complement the album, this research-like composition work has been turned into a film toying with a musical style of documentary, rumoured to reveal the mysterious mechanisms of inspiration. Within this particular framework, the musician’s creative act cannot be achieved from scratch, as it is the continuation of a work preceding it. In addition, the dramatic devices unique to musical documentaries are subject to a slight shift. The traditional crisis regarding inspiration changes here into a crisis of interpretation with the composer attempting to grasp subjects that are difficult to fit into a song. 1. Le Sphinx est-il une annexe du monument ou le monument une annexe du Sphinx ? This project has been produced with the support of the Direction régionale des affaires culturelles d’Île de France –aide individuelle à la création 2015.